This page always made me giggle. Shadow’s so insulted! I’m really curious what he thinks we should be thinking he’s going to do with that. Ha ha. I have no idea, but apparently he doesn’t approve of the idea of him using something as mundane as a knife as an instrument of murder. Blood magic, powering it to send it back? Not sure if mad at me guessing it right or at the audacity to assume blood magic at all. Carving a rune, I think. Shadow considers This whole trip to be a waste of his time. If he wanted to kill her, or could kill her, he could have done that when they first met. I can understand that she’s feeling very vulnerable, but I can also understand why he’s so irritated by having to explain over and over that he can’t harm her or betray her. Keep it up the good storytelling, you’re doing just fine. I’m really glad that that play of circumstances is so easily seen in their interactions, because that’s exactly what’s going on. 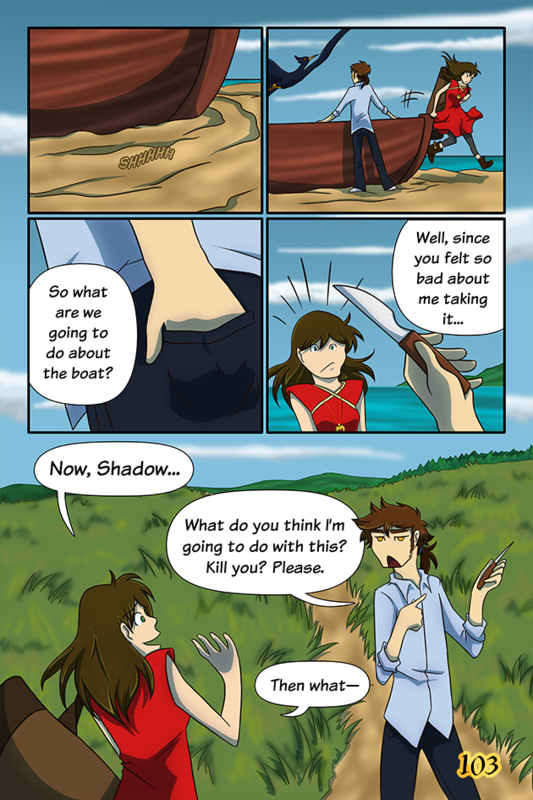 It would probably be best/easiest if Shadow actually just sat down and explained the rules of claiming a magician’s heart, but he’d run the risk of telling Thalissa more things that would be to her advantage (sort of how he let it slip that she could get him to do something for her in return for his heart). Haha. Panel 1: Shadow shanks Thalissa. Panel two: He flies away. Panel 3: Roll credits. But yeah, the tiny-ness of the knife is definitely problem #1.